With The Joint Commission (TJC) spending an increasing amount of time in Sterile Processing Departments, Perioperative Departments and Endoscopy Suites during site surveys, the focus on maintaining high quality endoscope-related documentation has become a focus for many hospitals. TJC surveys, though only occurring once every 3 years, have become a huge a point of emphasis for hospitals because passing them successfully is linked straight to their bottom line. This is due to TJC’s status as an accreditation agency for the Centers for Medicare and Medicaid Services (CMS), and any hospital that fails to pass a TJC survey is at risk of losing its Medicare and Medicaid funding – which can contribute 40-60% of a hospital’s top line. As you would expect, many hospitals have been putting increasing emphasis on areas where TJC is spending more time during surveys. One such area of focus is the storage and reprocessing standards of endoscopes within hospitals. As dozens of reports of endoscope-related infections entered the mainstream media over the past several years, it was inevitable that endoscope cleaning practices would come under increased scrutiny. As such, many hospitals visited by TJC in the last 24 months have reported that their surveyors spent more time on endoscope-related processes than any previous visit. TJC is not only focused on making sure that hospitals have documented processes for patient safety, but that they also follow them in practice. One piece of documentation that TJC has been asking many hospitals for is a tracer log related to endoscope usage. TJC surveyors typically look to make sure that there is a near perfect record of which scopes were used on which patients. 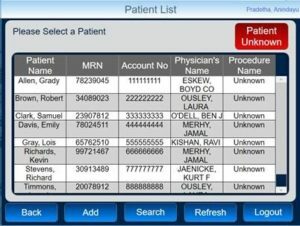 Many hospitals keep a decent log of scope-to-patient usage by utilizing patient stickers in physical log books or a system of spreadsheets. However, TJC surveyors aren’t looking for “decent”, they are looking for near-perfect, 90%+ accuracy when it comes to scope tracer logs. This becomes a serious challenge for busy endoscopy and perioperative departments charged with tracking dozens of scopes across multiple suites. When tracking scopes becomes a logistical challenge, using technology to solve the problem may be the best option. One such technology solution is iRIScope from Mobile Aspects. iRIScope is the industry’s first smart-cabinet based endoscope tracking solution that uses RFID technology to provide a seamless experience for nurses and techs. In the same way that medication dispensing cabinets require users to login and select a patient to ensure the proper medication is administered to the right patient, iRIScope requires users to login and select a patient to ensure a record of all scope usages to the correct patients. The system offers a host of other benefits such as smart alerts for potential dirty scope issues and re-wash alerts, but for busy departments the electronic log of scope usages can be a true game-changer.